Small streams and the edge of large creeks in Bolivia and Brazil. Bolivian Rams live among the leaves and tangled tree roots. First 3-5 spiny rays of male’s dorsal fin are elongated, and his tail is slightly lyre shaped. Being smaller than the male, the female lacks these features. Considered to be peaceful and a good community fish. Mating pairs are territorial, and if more than one mating pairs is kept in the same tank, much space and cover must be provided to allow for the creation of each pair’s territory. Good quality flake food, but the addition of frozen, freeze dried and/or live food should be provided. Mosquito larvae, tubifex worms, blood worms, daphnia, brine shrimp and cyclops. Being omnivores a balanced diet including blanched vegetables such as pea and cucumber will help the Rams reach their full potential. Provide with hiding places/caves made from driftwood and unglazed ceramic pots. In order to give them the best quality of life, and enjoy the fullest display of natural behaviours a well-planted tank should be provided. 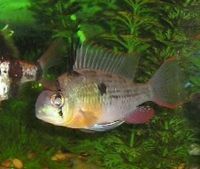 Not as sensitive to water quality issues as other Dwarf Cichlid, regular water changes are a must. Typical Cichlid when breeding, Rams form a pair bond, Bolivians are open substrate spawners, both parents will actively and aggressively guard their young. May change colour depending on mood. Blue-green highlights and red bordered fins set off the brown-gold body. Bolivians have black spot on both sides and a black line running through there eyes. Though not as popular, the Bolivian ram is hardier than the closely related Ram Cichlid. This page was last edited on 19 July 2018, at 06:50.